First thing to note is that not all BioFlex, PTFE and Acrylic Flex products can be cut to length. If the product has a push fit top in it (see picture above) there’s a thread in the hollow part of the BioFlex shaft that the externally threaded, push fit top fits into. 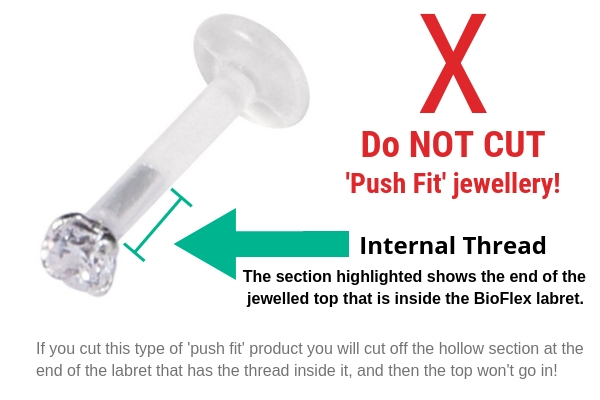 If you cut the end off the ‘push fit’ BioFlex labret, you’re cutting off the thread and there will be no hollow part to put the top into. 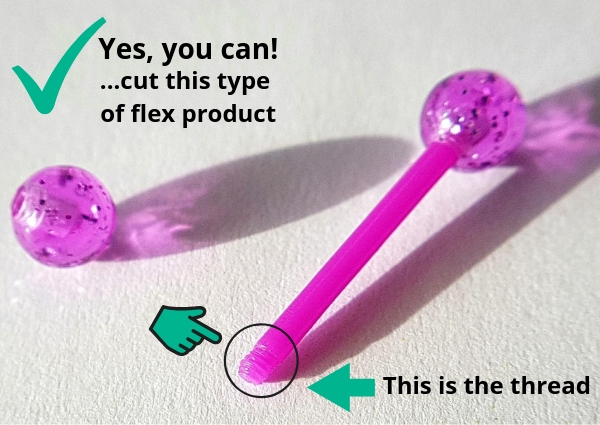 If your flex bar has an external thread on it, see picture above, this type of product can be cut to size. In this image we’re just reducing the length of the bar by 2mm. If you know how much shorter you want your bar to be, it’s easy, you’re just going to cut that much off the bar. So if you want it 6mm shorter than it currently is, you’re going to cut 6mm off the length of the bar at one end. N.B. 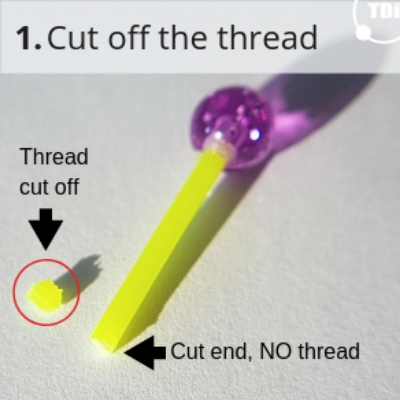 the thread is included in the length of the section you want to reduce, so don’t cut off the thread then another 6mm, as you will have cut off approx. 8mm! If you’re not sure how much shorter you want it, less is more! So cut a little off at a time (one end only) until you get to the length you want. REMEMBER, YOU CAN ALWAYS CUT MORE OFF… BUT YOU CAN’T ADD IT BACK ON! n.b. sharp scissors or a sharp blade is best if you have one. 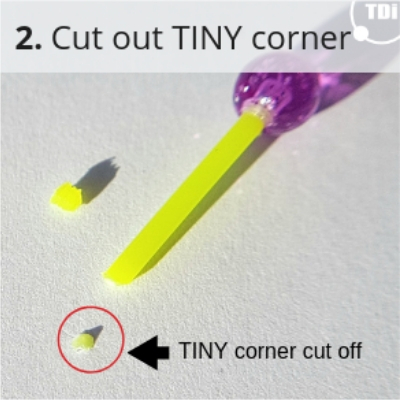 Once you’ve cut the end off the bar to the desired length, you now need to cut a TINY corner off the end of the bar (the red part as shown in the picture below). This helps the ball to screw back on. Now you’ve cut off the end of your bar to the desired length (including the TINY corner! ), your bar doesn’t have a thread on it. 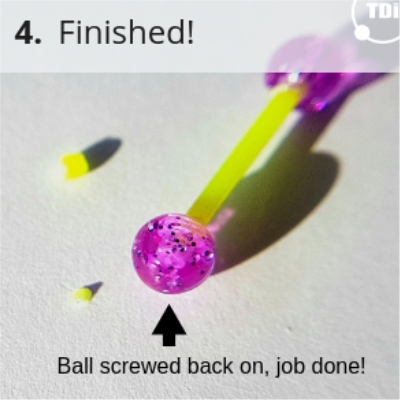 This is created when you screw the ball back on the end of the bar. 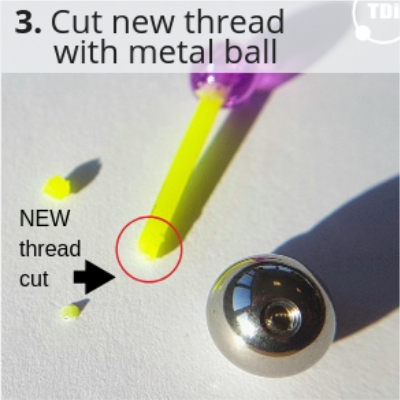 The thread that is inside the ball cuts into the flexible bar and creates a new thread on the bar. 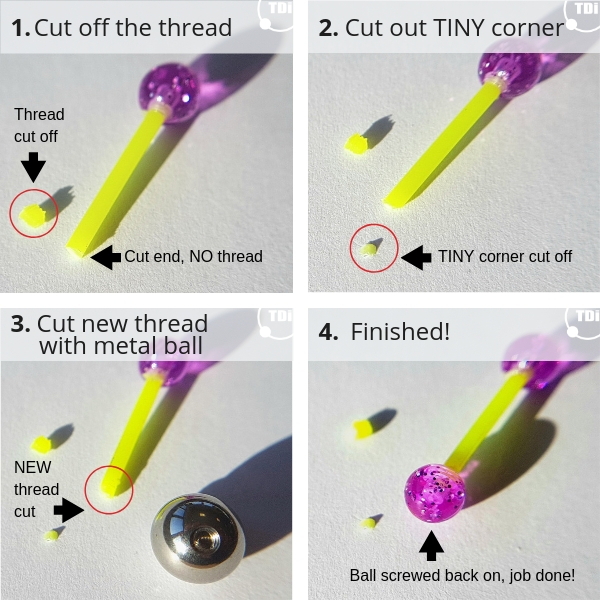 If you have a metal ball, this can be easier to screw back on and create the new thread, but any material ball will work. It’s REALLY important to make sure you screw the ball on STRAIGHT. If you screw it on at an angle it will not sit straight and may not stay on properly at all. When you’re screwing on the ball, at the same time you should gently push the bar into the ball, you must screw and push at the same time, if you just push it in it won’t cut a thread and will not be secure. Check out our full range of BioFlex, PTFE and Acrylic Flex products online now! p.s. if you’ve ever wondered what BioFlex and PTFE actually are, find out more on our info hub. 2015 © Copyright Tdi Body Jewellery. All rights reserved. All prices GBP.